I wake myself up in the mornings with Origins GinZing scrub cleanser. The citrus-y scent perks me up (and the caffeine helps too! ), and I like using a gel that exfoliates for the mornings. Afterwards I apply a little bit of Origins Plantscription anti-aging serum. It's never too early to start fighting those wrinkles that are bound to appear at some point! I finish the morning with Origins GinZing moisturizer. Again, I love the GinZing line, and this moisturizer offers good coverage without feeling greasy. I shower in the evening to save time in the morning (sleep is too precious to me! ), and I use Origins A Perfect World cleanser after shampooing and conditioning my hair. My skin has been insanely dry this pregnancy, so before bed I apply a little Origins Drink Up Intensive overnight mask to replenish my skin and keep it from being so flaky. Disclosure: Origins has no idea who I am, and I was not asked to write this or compensated in any way. 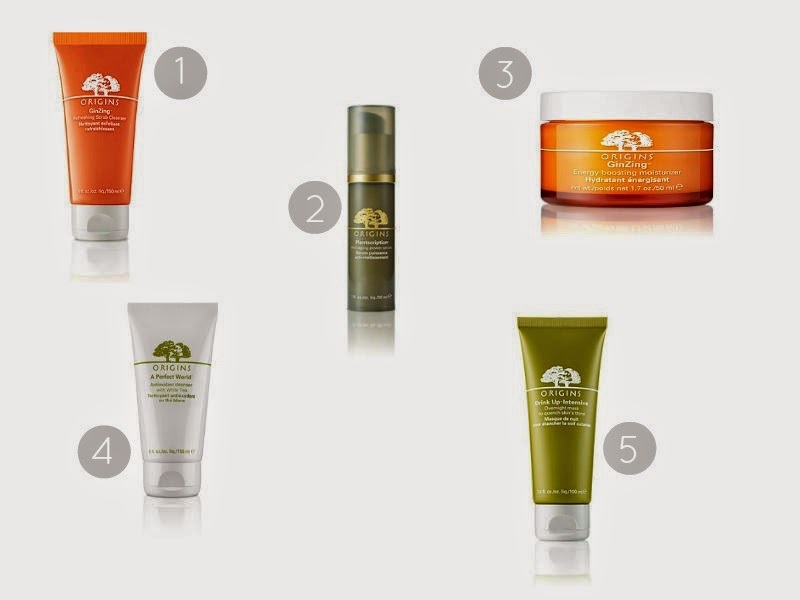 I just love Origins products!